Writing a will might not be the first priority on your to-do list, but it is an important document that you’ll need handy — most times, unfortunately, when you least expect it. About six in 10 adults don’t have a will prepared, mostly due to procrastination and lack of property, according to a recent AARP article. At Valente Law in Chicago, our attorney Charles Valente is well-versed in estate planning, probate and wealth preservation law. He knows how to write a fantastic will for your future, so contact him today to see how he can help you and your family! There are a lot of things to think about before writing your will. But where do you start? Who do you include? 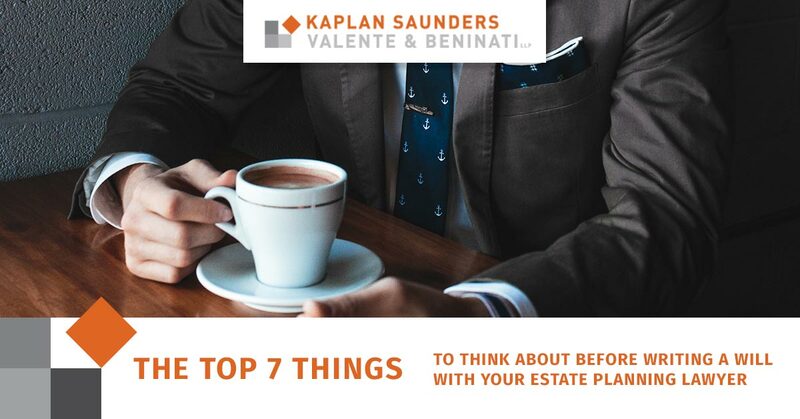 Valente Law is here to answer some of your questions with this list of seven things you should think about before writing your will with your estate planning lawyer. 1. Find a personal representative. This personal representative, also known in legal terms as an “executor,” is essentially the person who will ensure your final wishes are accurately carried out. This person ultimately becomes the pinpoint person for managing your estate, so make sure you choose someone who will have your best interests at heart and have the time to take care of everything that needs to get done after you pass. You’ll likely want to choose someone who is also a person you selected as a beneficiary of your estate — they’ll likely be more willing to offer their help since they’re actually receiving something from you. 2. What kind of personal and real property do you have? Establish what kinds of real and personal property you have, as a will typically covers both categories. In your will, you can only pass on what you solely own, so if you have joint ownership of something, you can’t necessarily include that property in your will. 3. Who do you want as your beneficiaries? This is an important thing to consider because your beneficiaries are basically the people who you’re giving your real and personal property to in your will. Unless your family dynamic is especially complex, this should be a fairly easy decision — your children, spouse, brother, sister, etc. You want to be very clear and specific in this part of your will, mostly because you won’t be able to change it after you’re …. Well, gone. 4. If you have children: Who will become their guardian? If you conform to a modern family structure, your spouse or partner usually gets custody of any minor children you both may have. But you want to think about who your kids will go to if both of you unfortunately pass away at the same time. Have at least two to three people listed, in order, and check that it’s OK with them first before putting them down in your will. This person should be someone who is responsible, and someone you trust dearly. 5. If you have pets: Who will they go to? Sure, our furry friends are like family members to us, but the law defines them as personal property. If you have any pets, include who you’d like them to go to in your will, as well as any special care instructions. Like you would with your kids, make sure to ask this person ahead of time so they aren’t shocked when Fido shows up at their door after you’re gone. 6. What do you want to happen to your social media accounts? This is a fairly new consideration, since, even 20 years ago, you didn’t think have to think about what would happen to your Facebook account if you died. It’s now important in modern times to consider what you want to happen to your social media accounts after you’re gone. Facebook has a new feature that allows you to entrust someone with your account in case something happens to you. If you want your digital legacy to carry on, utilize this setting and name someone as your social media beneficiary. If that seems a bit morbid to you, just give someone you trust and love your passwords. They can then delete your accounts, if that’s what you decide to do. 7. Write it with a qualified and trained lawyer. Estate planning lawyers are trained and experienced to write a will that will meet your needs and desires. There’s a lot of legal mumbo jumbo that goes into a will, and chances are, unless you have a law degree, you won’t know how to write a proper one yourself. Attorney Charles Valente knows the ins-and-outs of estate planning law, including will documentation. His goal is to provide a simple, organized and comfortable approach for his clients to help them transition whatever goods they have to the next generation. If you’re search of a top-rated estate planning attorney, give Valente Law a call today at (312) 832-7890 or fill out an online request form to schedule an appointment.